The episode hurtles from the vaguely implausible (Bart is somehow the first to detect a comet hurtling towards the earth) to the very implausible (Congress rejects evacuating Springfield because of a rider granting $30 million “to the perverted arts”) to the totally implausible (the comet is burned up and shrinks to the size of a Chihuahua’s head) without missing a beat and it’s just fine. No one does, so the entire town is set to work both taking a mandatory test (where, as Carl and Lenny demonstrate, the sheeplike populace is all to willing to turn over all their personal information to a “secret corporation” in exchange for the occasional drone-delivery), and building Burns’ ark. (Which looks not a little bit like the Planet Express ship from Futurama, where Vebber used to work) So, with stage one of the premise under construction at the same time, stage two introduces the concept of how this mass hysteria-induced project is going to affect the Simpsons. There, too, a few promising subplots split off, as Lisa becomes obsessed with the fact that that she’s revealed to be one point behind Ralph Wiggum on Frink’s scale, while Bart resides at the very bottom of the list, condemning him to be surely left behind to the terrifyingly vague Nostradamus’ prediction. That Lisa would get fixated on scoring only 475 on Frink’s 500-point scale (next to Ralph’s inexplicable 476) makes delightful sense. She at first sighs in relief that she’s high enough to satisfy that fact that, as she puts it, “all my self esteem comes from tests,” while still leaving a modicum of room for polishing and refining. So she starts annoyedly tailing Ralph, whose day, as expected, takes the form of enjoying the playground slide backward and eventually wandering blissfully through the high rigging of the Burns ark construction site. Along the way to that point, Vebber throws in some jokes I’d put up next to any of the show’s best. 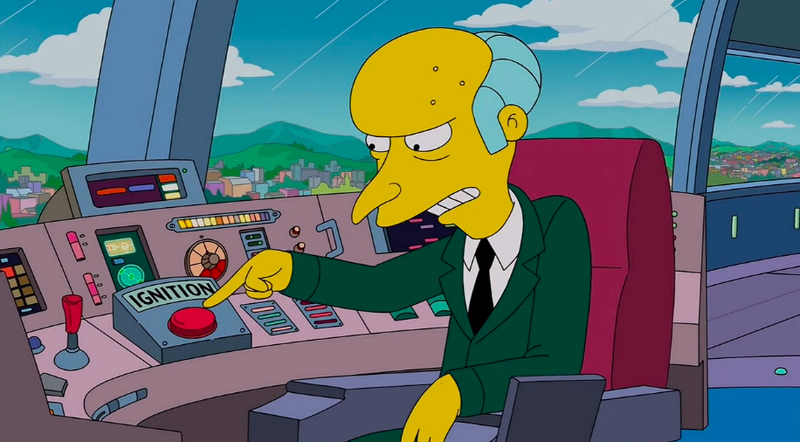 Lisa checks Ralph’s phone to find an automated menu from the Chief instructing callers to press one “if Ralph is stuck in something,” and two if “something is stuck in Ralph.” (Three is for Ralph, instructing him not to take apart the phone, as “Daddy is not in the phone.”) Seeing Ralph wandering, “Swee’Pea” or “Mr. Magoo”-style on the high steel, Wiggum reassures Lou that Ralph is fine, since he’s not a cartoon cat in this scenario. “Never be a cat in a cartoon, Lou. Never,” the Chief pronounces solemnly. On the other hand, Bart’s dilemma (about which he adopts his signature “who needs a stupid space ark anyway” defensive posture) turns out to be a red herring, as Homer’s atrocious penmanship on the test not only saw his entry being mistaken for Bart’s, but—at least partly—accounted for his position as the town’s dumbest dummy. First, there’s another great joke, where Marge’s angry demand that Frink check his data on Bart’s behalf hears Homer let out a peerlessly amazed, “Wow, Marge, you really love Bart!” (Dan Castellaneta, take a bow.) Then, after tweeting out his failure in order to get ahead of the story (Homer’s handwriting isn’t the only issue, certainly), there are some more funny gags as all of Springfield treats Homer with condescending concern in the following days. Attempting to see the new Noah Baumbach joint (Brooklyn Bound, starring, I’m spitballing here, Greta Gerwig), he’s instead steered into The Nut Job 3: The Squirreling. The Apple genius bar rejects him. The sarcastic clerk guy (his name’s Raphael, by the way) fleeces Homer for the dumb guy aquarium admissions package. (Never buy the splash insurance.) The dispirited Homer self-selects out of Mel’s Shakespeare in the park performance to see Sesame Street On Ice. Even his drinking buddies’ patronizing drives him out of Moe’s to the cross-street establishment “Shmoe’s.” “Hiya, Homer,” greets a suspiciously Moe-esque voice from inside. It’s around this point that it became clear that the episode wasn’t planning on paying any of these threads off as satisfyingly. The turn that Marge sets out to tutor Homer on his handwriting does lead to a lovely little montage, scored to some half-sincere swoony, inspirational music, of Homer working to improve, culminating in him leaving a trail of lovely but still Homer-like calligraphy notes for Marge to follow. (She is as lovely as a bowling ball right out of the ball-polisher.) But the whole penmanship thing is an unprofitable short-circuiting of the “who gets to go on the space ark” storyline, which itself is shunted off to single scene right before the end credits. Everyone turns on Burns just as his actual, functioning rocket(?) speeds off into space, leaving Smithers forlornly behind and the lone Burns being strangled by a robot servant. As stated, The Simpsons can accommodate the far-fetched as long as some rigor is applied. This is the sort of narrative shrug that makes a guy feel foolish for having gotten invested in the story in the first place. Lisa’s story, too, comes to naught, albeit with Frink’s amusing confession that he’s bumping Lisa up ten points for “discovering huge flaws in my test without telling anyone.” Again, the promising setups for Lisa’s story, Homer’s story, Burns’ story, Marge’s fierce defense of Bart, the town’s (admittedly underdeveloped) doomsday mania—they all unfortunately get left behind by Burns’ too-hasty rocket trip. LaMarche’s Welles is always a hoot. I especially liked Burns’ heavenly dream sequence, where Welles confesses that he’s already way over-budget with that rainbow God asked him to direct. No worry—Welles is planning to cut costs by playing the color red himself. Lisa is reading The Girl With The Rub-On Tattoo. We can spot Frink’s back-flipping dance double hiding behind the couch during his musical number. 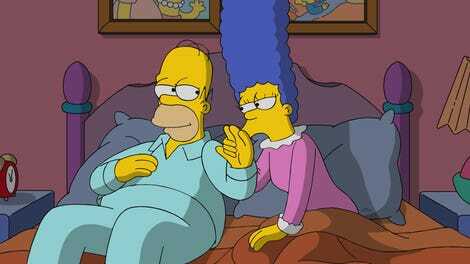 Marge and Homer do share a silent look of concern at the claim that Nostradamus’ doomsday will come after the election of the Antichrist as president. “Silence, you thinkertons!” I’m also a sucker for old-timey Burns-isms.